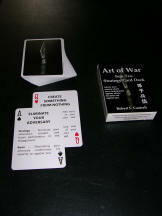 Today’s lesson comes from the two of spades in The Art of War Sun Tzu Strategy Deck Titled, “Score A Small Victory Along The Way” Strategy, use a minor lapse in your adversary’s attention to gain an minor prize. Basis, small victories can mean the difference between winning and losing. Our goal when dealing with dynamic encounters involving emotionally charged people is to build up or advance your position. Sun Tzu said “you have strengths and weaknesses. These come from your position.” The same holds true for your adversary who is always thinking, innovating and adapting his own ideas to exploit opportunities you provide to give him the advantage. Col John Boyd asked the question, what is the aim and purpose of strategy? Col Boyd’s answer, “To improve our ability to shape and adapt to unfolding circumstances, so that we; can survive, on our own terms.” To shape adapt and reshape circumstances we must be focused on positioning. It is the position we occupy that is crucial to our success. The term "positioning" we must understand is not solely about our physical location. It is also very much about the climate of the situation or conditions we find ourselves in or even more importantly what position does the adversary see himself in. Is it one of advantage or one he sees as disadvantageous? So positioning factors in not only the physical environment but the mental and moral components as well. When we understand this and the fact that no position gives the advantage forever and that most positions in all three dimensions (moral, mental and physical) degrade over time. So we must be prepared for the ebb and flow of conflict and possess the ability to adapt when circumstances change. Example: As you respond to a domestic dispute the advantage centers on your positioning. When you pull up out in front of the crisis location lights and siren think to yourself who has just scored a small victory along the way and gained the advantage of positioning, is it you or the emotionally charged person who has just seen and heard you arrive? Who knows the environment better? Who can see who better, you from the outside or an adversary on the inside looking out as you approach robustly and openly? On the other hand if you arrive, undetected emergency equipment off and parked down the street, who in this scenario scores the small victory as the emotionally charged person is wondering simply where you are? Are they coming? Did she really call? What’s going on? As you approach from a short clandestine location are you better able to gather more information that allows you to get more resources and put a better hasty plan together as your adversary is still confused and disoriented by the unknown? Are you able to see and hear, make better observations and orient to the problem with more accuracy allowing you to tactically set up and position yourselves where you cannot lose? Does this approach allow you more tactical, options i.e. some kind of ruse, negotiations or if entry must be gained a better plan for doing so? To score a small victory’s it is important to keep in mind that no position is perfect for meeting every tactically challenging situation. Positions in all three dimensions of conflict degrade over time so it’s important to be able to take advantage of the positions you choose effectively to maneuver more advantageously if we are to seize the initiative and get an adversary to come around voluntarily to resolving on our terms and if not voluntarily so we are ready to influence the issue with sound strategy and tactics.